(11 MB/second and greater), long-range (up to 25 miles), dependable, and economical wireless solution for companies who need to connect between existing Ethernet networks. (usually located in two or more physical locations). These high-speed connections eliminate a business dependency on leased lines. The savings realized can quickly pay for the initial installation costs. EduTech’s wireless solution connects remote sites into a single WAN, overcoming obstacles such as highways, railroads, and rivers that make the use of copper wire or fiber-optic cable practically impossible. EduTech also offers wireless solutions for within your physical location. “Access Points” and “Client Adapters” enable a business to add freedom and flexibility to their existing LAN by extending into a wireless local-area network. Wireless local-area networks (WLAN’s) offer a viable solution for IT departments who need flexibility for frequent LAN wiring changes. WLAN’s also provide answers for: locations which are not conductive to traditional wiring due to building or budget limitations, leased or temporary sites. EduTech’s wireless solutions, are ideal for sharing high speed internet access. Wireless connected WAN’s and or LAN’s in an organization, previously needing multiple internet accounts, are able to consolidate into a single point of internet access. Using the savings realized, they can afford to purchase just one “high-speed” internet account, and then share that connection across their wireless network. EduTech currently has installations with a wide variety of customers. 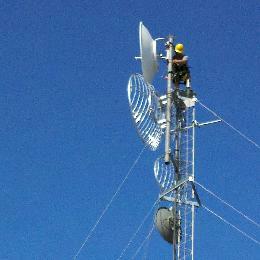 Their needs are often different and so too is each Wireless Systems we install. Click on the link above to see more information on some of these locations.